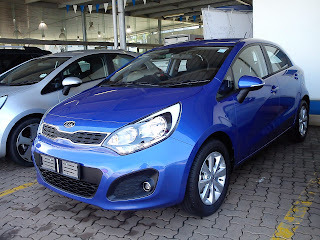 The third generation Kia Rio has come a long way from what it was when first launched in South Africa; it was by far one of the ugliest cars out there. Although they were priced well at the time, you still had to be a real moron to buy one, considering other options out there of course. But this has all changed over the years ... and the end result is magnific! The 2012 Kia Rio has gone through a crazy transformation and has become one of the most attractive hatch backs on the road. The old design has been totally scrapped and new age thinking was put into the new design. Rhia Singh from Kia Motors Umhlanga was kind enough to assist me with the test drive of the new Kia Rio. The model that I test drove was the 1.4 Manual, which was one above the entry level 1.2 Manual. Feature wise there was nothing to complain about, the car comes fully loaded with design and layout, of the interior, following trends with its big brother, the Cerato Hatch. Instrument cluster and consol was nicely finished with chrome trims and I particularly like the fact that the steering came with a leather finish, instead of a plastic moulded steering, like the one found in the Hyundai i20. This gave the car an expensive feel to it, instead of a value for money feel, it just felt luxurious. Another feature that lent a hand to that feeling was the centre hand rest between the driver and the front passenger; it was just the right height to change gears. I normally like to drive with my legs stretched out in front and not bent, because of a knee problem, as a result I have to push the driver’s seat all the way back. After doing this I checked the seat behind me and there was enough leg room for a passenger to sit behind me. Ok enough about the inside.... long story short, it’s done up very nicely and I’m sure you won’t be disappointed. Let’s move onto the engine, the Rio range all have 1.4 litre engines, apart from the entry level 1.2. The 1.4 produces an ingenious 79kw and 135nm of torque, and to top it all, this power is delivered to the drive wheels via a 6 speed gearbox! The road test was carried out through our usual route to Sibaya and back. From the word go the car felt responsive. The effort in maneuvering the Rio was minimal, the car felt really light due to the sensitivity of the power steering. I only had an issue with visibility of the front of the car over the dash board, but I suppose the height adjustable driver seat will sort that out. On the highway the Rio was executing my instructions to the T. Every gear felt alive, sixth gear brought the fuel consumption down to between 3.5 to 4 l/100kms at 120km/h. I suppose if you learn to drive this car right you can achieve better combined fuel consumption than the claimed 6.4l/100kms. Handling was pretty good as well, although the ride felt more comfortable than sporty. There was a bit of a struggle to overtake on an incline when in sixth gear, but this can be expected. Dropping the gear to fifth saved the day, and fuel consumption didn’t go up too much. 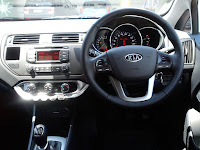 The 1.4 manual is currently priced at R154900, and I was told that Kia is due for a price increase in the near future. The Rio comes standard with a 4 year/60000km service plan and 5 year/100000km warranty. The end result of the Rio is well worth it for the current price. The road test was carried out through our usual route to Sibaya and back. From the word go the car felt responsive.